Fort Abraham Lincoln State Park has long insinuated itself among the ranks of haunted places of North Dakota, by always seeming to provide just enough atmosphere—a retreating footstep here, a fading whisper there—to make the ever-growing sub-culture of paranormal enthusiasts emphatically declare the place to be a haven to phantoms, ghouls, spirits, lingerers-on, or any other name by which a ghost may be called. Even the skeptics, when presented with stranger circumstances than may be easily dismissed by logic, are sometimes forced to use the I-don’t-know-how-to-explain-it shoulder shrug. When the Custer House was reconstructed in 1989 it seems the men and women who long ago lived and died at Fort Lincoln were themselves resurrected. Interpreters and tourists both reported paranormal experiences from the beginning, and as more buildings were added, so too were hauntings to the chronicles of the strange and unexplained at Fort Lincoln. A woman wearing a black dress is seen looking out a second-floor window of the Custer House; footsteps are heard pacing the sergeant’s quarters in the Barracks; the voices of weeping women echo along the boardwalk; a shadowy figure stalks the Commissary at night; horses’ hooves stomp the dirt of their stalls in the Stables. Our operation has expanded exponentially over the years. We added an afternoon children’s bash, a carnival-like series of games and prizes for children too young for the evening attraction. The main event, once occupying only one weekend, is now scheduled for two with the possibility of a third, as required by popular demand. 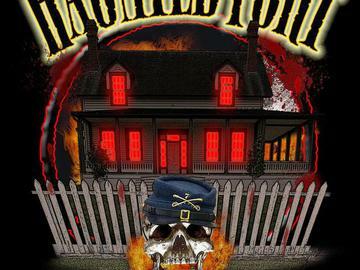 Haunted Fort has evolved into the Fort Abraham Lincoln Foundation’s largest fundraising event, with over 2,500 people turning out to be terrorized in the two days in 2010. All of the proceeds are used to maintain the region’s best interpretive program, and other foundation operations within Fort Abraham Lincoln State Park. It used to be that when the leaves began to turn, we would get ready to close up shop for the winter. Now, our minds change with the leaves—we turn away from Custer and the Mandan Indians and delve into the world of Poe, Le Fanu and King; of Michael Meyers, Freddy Kruger and Jigsaw. We plot, build, destroy, disembowel and dismember. With our own phobias ever in our minds, Haunted Fort becomes the place where nightmares come to life. prone to seizures, or individuals in poor health, should use caution. Please NO photography or videography of any kind while touring the sites. DO NOT touch, push, or harass the staff and volunteers of Haunted Fort. Anyone who does not follow this rule will be asked to leave.